Smoke Heaven: All Smoke and No Mirrors chef Joel McWaters works with chicken and pork in less than ideal conditions at Saturday’s Battle of the BBQ. “It hasn’t been too bad,” said McWaters of the wet conditions. 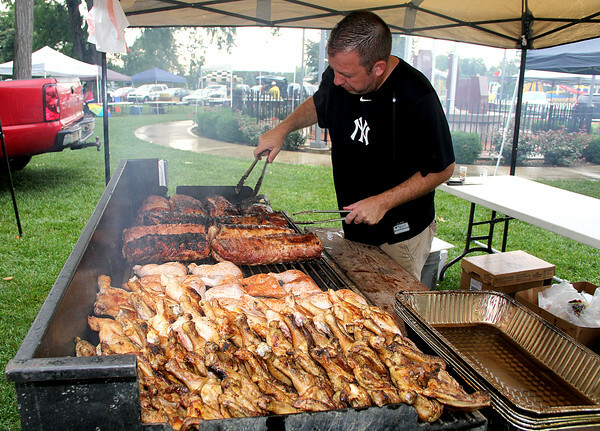 “The biggest challenge is carrying everything in to set up.” McWaters sold the chicken as part of raising funds for the Boone COuty Cancer Society, and entered into the hot/spicy, sweet and dry rub/marinade pork categories.